new Chompo website! All one-eyed dog all the time! A week ago, on an otherwise quiet morning, modern warfare struck a savage blow in the Ooze Office. One of my dogs, the big one, pawed the other one's eyeball almost all the way out of her head. Apparently, the big one, Grüen, launched a retaliatory attack on a territorial incursion of the water dish. I was on the phone when the ruckus began. Anyone who has the pleasure of a 'home office' knows dog barking is a dead give away that you can't afford to work somewhere with elevator music and a vending machine full of Cup O' Noodles. So I ignored it -and it stopped. Chompo- the small dog comes into my room and calmly jumped onto my lap. 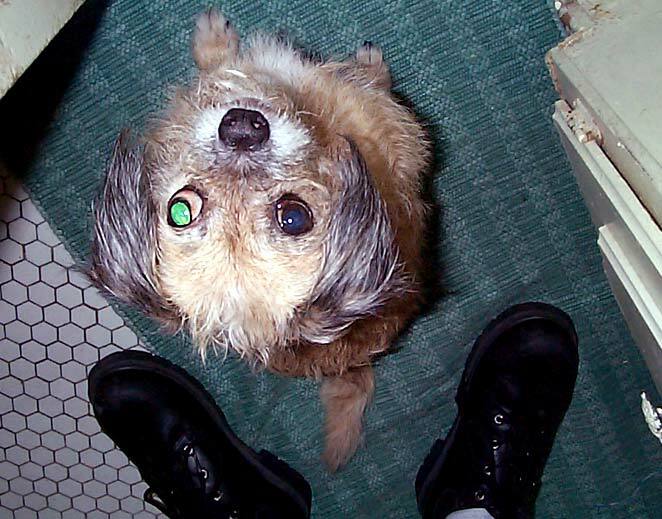 When she turned her head, my dog looked like a combination of Marty Feldman and the Toxic Avenger. I wish I had taken a picture. Instead, I did what any man of civilization would: I screamed. Then, calmly into the phone I said, "Sorry, but I have to go. One of my dog's eyeballs fell out." 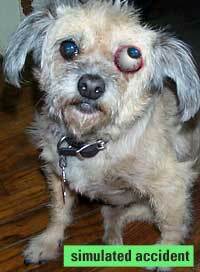 I put on my shoes, gathered up the dog and ran her to the ghetto vet near my house where they sewed up her eye. Just recently, they pulled out the stitches, revealing a big, swollen eye. Waving my hand in front of her face, it became obvious that the dog lost her vision in that eye. The doctor also said her dead eye has a good chance of popping out again. We could pay $1000 bucks to have it removed (and she can wear an eye patch like a hairy pirate) or hope she doesn't run into a sharp knife, eye first. Ooze is a humane organization, so we decided to hold onto the money. ($1000 bucks is a new computer) The swollen eye has settled into her skull a bit, so it is not as bug-eyed. 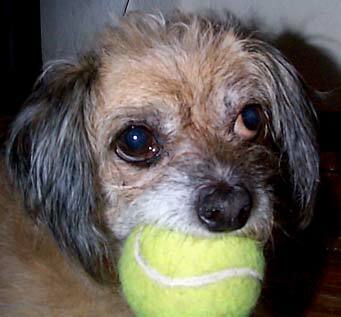 Chompo is currently in good spirits and very happy when she lopsidedly chases a tennis ball. My other dog claims new, more vicious attacks are just around the corner- unless the water dish is kept full. Good thing I have not fathered any children. I would be too busy to notice when they disembowel each other. Matt Patterson believes in peace and harmony among all God's creatures. Unless you want to eat them. Then it is OK to use a big stick and smash their heads in.